Jane Berry shows James Mwangi how neatly an AidPod fits in a crate… or is she just begging for funds? Conventional ‘branches’ are not appropriate in densely populated ‘shanty towns’ – mobile services are. Training up shopkeepers, who are already informal banks – giving credit and collecting debt – to be your agents is an appropriate approach too. This method maps directly onto our plan to ‘para-skill’ retailers in remote rural communities for the ColaLife pilot. What do retailers do? They sell the benefits of the products on their shelves. If we can get ADKs (Anti-Diarrhoea Kits) onto retailers’ shelves in remote communities and train them in their benefits, they will become agents of improved public health. I’m always amazed at the patience of people, particularly poor people, in Africa. They typically travel for hours and at great personal expense, they queue for hours at their destination for the services they need without complaint. Customers, no matter who they are, don’t have to queue for long for Equity Bank services. When customers of Equity Bank are asked why they use the Bank’s services the responses are interesting. Particular financial products and interest rates are never mentioned but being treated with dignity is. James says that at Equity Bank ‘we hire people on attitude’. Humility is a key characteristic of Equity’s staff – you can always teach the technical skills. What James described really was a new modus operandi. He said that the Bank is ‘CSR with a commercial edge’ and this is reflected in the Bank’s mission ‘to be the champion of the socio-economic prosperity of the people of Africa’ – no mention of return for shareholders, you will notice. However, if you are a shareholder in Equity Bank you will have done pretty well, with growth of more than 100% per year since James Mwangi took charge. And he concludes enthusiastically ‘still only 23% of Kenyans are banked so we can continue to achieve these growth rates for years to come’. I have worked in all sectors but consider myself primarily to be from the NGO/social sector. This sector prides itself on its bottom-up approaches, its respect for individuals, empowerment and so on. 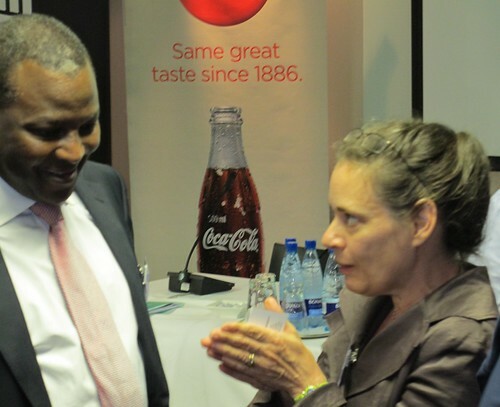 However, the more I see how commercial organisations like Equity Bank, SAB Miller and Coca-Cola work, the more I appreciate the way they respect the operating environment they find themselves in and play to its strengths, with a sharp focus on delivering what people want. Sometimes, I even think they do a better job than many parts of the non-profit sector. Examples on request!